The 3 Dimensions of Design” (3DD) is a model that can be used to strategize the adoption of a human-centered problem-solving practice inside an organization. In my world, Design is a human-centered mindset; a mindset that can be adopted by anyone in the organization regardless of roles and job titles. Per extension, anyone that possesses a human-centered mindset is a designer. To design, is also a verb, and exists only in the act of designing; so what is designing? Designing is the practice of generating value through problem-solving. Per extension, anyone that possesses a human-centered mindset is a designer, and the next definition will introduce, a problem-solver. From the previous definitions, we can inductively deduct that being human-centered (or design-driven if you prefer) means using a human-centered mindset to solve problems with a solution that generates value for humans. From this point, we can define the primary requirements of a human-centered (or design-driven) organization: hiring and or training “human-centered problem-solvers”, regardless of their role or job title. Framing the problem from this perspective generates some interesting questions: What are the abilities necessary to be a “human-centered problem-solver”? How can we scale these abilities across the organization? The model introduced in this article aims to provide a novel approach to the underpinning problem of building a human-centered organization, and in doing that proposing an answer to these questions. 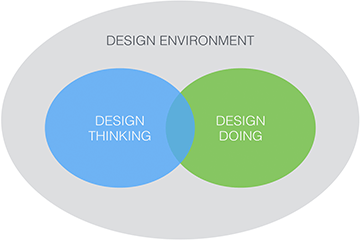 The act of designing, as previously defined, is a function of 3 dimensions: thinking, doing, and environment. In Figure 1 we can see their interplay and notice the underlining assumption that a human-centered (or design-driven) culture is a function of mindsets and environment; C=f(M/E). The thinking and doing activities in a given context establish a two-way relationship that creates the organization’s culture. The “thinking” dimension is defined by the ability to get “a deep holistic human understanding” in exploring the problem domain. This ability implies skills to empathize, learn from the user and define a problem domain based on human’s needs. The “doing” dimensions is defined by the ability to “make meaningful connections materializing new possibilities” in the form of hypotheses. This ability implies skills to ideate and generate and downselect a range of solutions and build a real representation of them in the form of a prototype to propel the design conversation. The “environment” dimension is defined by the physical context; where the workforce operates. Ultimately, the physical environment is the system that enables and nurtures the “thinking” and the “doing” activities.